Here are a few highlights of our field trip day. We sunk our lures and caught some fish. What a beautiful day it was here in Arkansas for a fishing trip with friends. It was nice to have the private creek all to ourselves and picnic in the warm spring sun. Cold Kool-Aid and Doritos, Sara’s wonderful chicken salad, and some fishing poles to share… what more do you need? I took the picture above while I whistled the theme to the Andy Griffith show on our short walk down to the “big-fish” part of the creek. 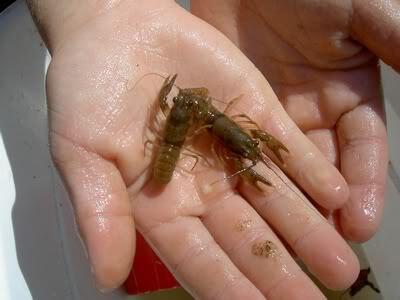 Funny that we caught bigger fish today in the “small-fish” part of the creek. There was one red-eyed fella who watched us all day in the water and refused to bite. The kids were afraid of him, but managed to get wet and wade in anyway. 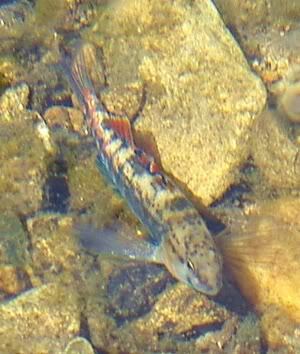 We saw some pretty little rainbow-colored fish that actually sat on the bottom of the creek. I guess they are some form of fresh-water goby. What a colorful fish! Anyone want to identify them for me? I haven’t had time to do any research. We caught three or four of them. The females were not as bright as this one. I think it is a male. 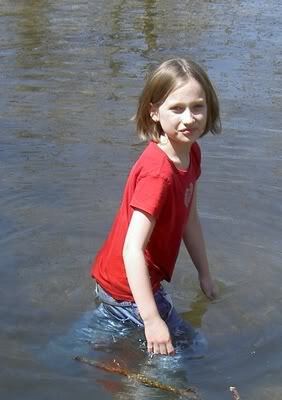 They had a nice 12 foot deep swimming hole where the creek had been dammed. None were brave enough or good enough swimmers to attempt a dive. Two of the kids actually swam, but ALL of them got wet through-and-through! 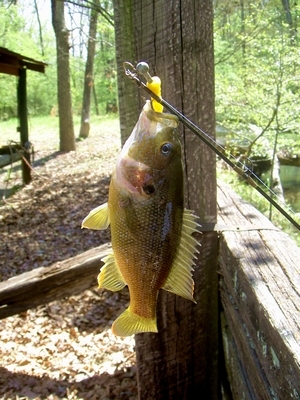 At first they were fishing with store-bought lures. Most of the fish weren’t going to fall for that. Then my friend’s husband broke out the crickets and the fish went crazy. Morgan really enjoyed fishing and has a pink nose from sunburn. She’s out cold on my bed right now – taking a nap before dinner. She didn’t catch a fish today, but she did fall off of a swing and scrape her back up… poor thing! The cool breezes today made the trip delightful. I can’t get over how mild it is as we near the end of April. The highest the temp got today was probably near 72 or 74 degrees. In the next ten days, it won’t get over 83 degrees according to the Weather Channel. That will be nice for our other planned field trips. We also caught a few crawdaddies, some fresh-water clams (not like it was much sport to catch a helpless clam), and a tiny green creek frog. The frog managed to escape our bucket when we weren’t looking, but we set the other captives free before we left. 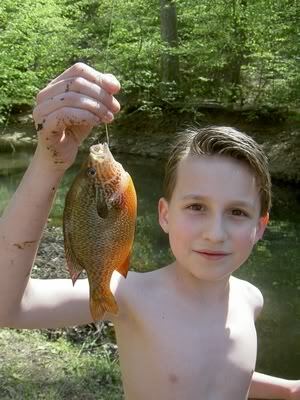 My son caught his first fish with a little help (my friend’s husband cast the line with a cricket on the end). It was a beautiful longeared sunfish! They are the loveliest little critters. 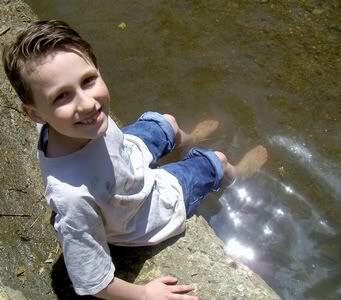 He was aflame in the sunlight and took me by surprise when Kaden pulled him up out of the creek. I didn’t know such pretty little fish were nestled in the creekbeds of Arkansas. My picture doesn’t do him justice. Check out the link for a glimpse at how they reflect light with brilliant oranges and blues. What a fun fishing trip. I hope we get to go back again in a few weeks. Next time I’ll remember the sunscreen and take a jug of tap water and a towel to wash our feet off before we get in the car! The kids were filthy! 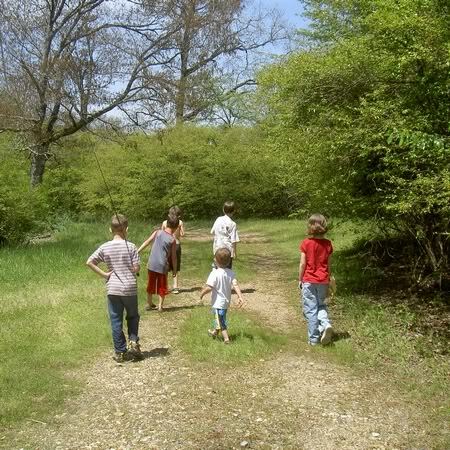 I love the picture of the kids walking down the path. I’m with you, I’d be whistling Andy Griffith too! Wow! What a beautiful day! Thanks for sharing all the pics. makes me want to go fishing! How fun! I wish we could have joined you. 🙁 I’m sure y’all had more fun than I did… me and my gall stones. LOL. Love the photos. If you haven’t already done the animal classification unit in Konos, those pics will come in real handy for it! Thanks Jamin. 🙂 It was a pretty day. Hope you will take your crew fishing! Bev – Yeah, I bet I did have more fun than you! I’m praying you get better quick. I hope you’ll join us when we tour the riverboat. No, we haven’t done animal classification yet… but we always try and classify things we see and catch. We’ve done quite a bit of it over the years. Kaden helped me narrow the classification for the fish down yesterday before we posted. 🙂 He really enjoys stuff like that. He reads insect encyclopedias like they are going out of style. He is the ONE to call on when you want to ID a bug! What a wonderfully timeless experience for your children! I wish I had similair things to offer my girls. I just don’t have the knowledge to do so and I’m not really sure where I would go to gain that knowledge. Fun! Robert’s been wanting to go fishing, so as soon as you get back to me about the dates I sent you (ahem! ), maybe we could all go together! 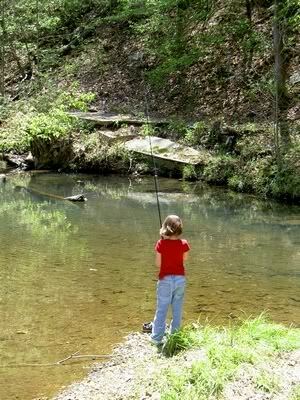 Jenny – Yes, I’m sure they will remember catching fish in the creek. I don’t know much about fishing, either. I’m not a big fisher-lady. I have only caught a few fish in my life and I have certainly never killed any. I love eating fish, don’t get me wrong… but I would rather someone else do the dirty work. We let all our fish go after unhooking them. One of my friend’s little boys who’s daddy is a hunter did the unhooking for us. I don’t think they baited any lines, either. I certainly didn’t. Maybe you could go hang out with someone in your homeschool co-op who knows how to bait and unhook. Then you just cast the line and wait! Easy as pie. Rhonda – We don’t own a fishing pole and I’m not great at baiting… so if you bring poles up here, be prepared to do your own dirty work! Also, the creek was private, but I’m sure they have other fishing areas that are public around here where we could go. 🙂 Come on up! Jennifer – Thank you so much. I love taking pictures. That is what I usually spend the entire day doing when we go on field trips. I did enjoy catching some little gobies in cups on this trip, though. Wish I had a freshwater tank set up so I could have brought some of them home. They were so cute! 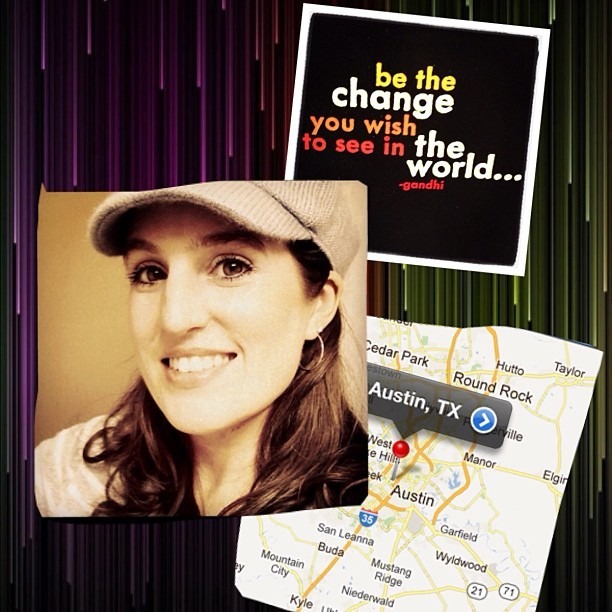 Yes, I do scrapbook… well, at least I love the idea of scrapbooking. I am nearly 9 years behind in my books, which makes it more truthful to say NO. I have three years done for my son and one for my daughter. 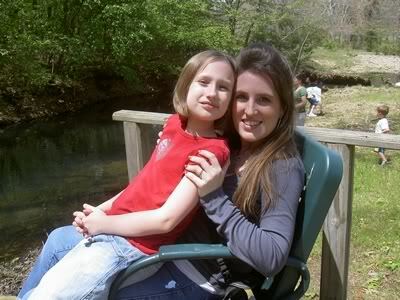 They are 8 and 10 now… and half way through that year by this summer. 1/2 of my belongings (including the past five years worth of memorabelia) are in storage in another state and I am one of those “MUST DO THINGS CHRONOLOGICALLY” scrapbookers. Therefore, I am unable to scrapbook until I get “caught up”… which at this point is nearly impossible. Maybe some day I will have time to get back into scrapping. I am rather good at it once I sit down and actually do it. I make my own hand-made cut-outs and drawings for my books and everything. I just don’t have the time or all of my supplies in the same place. 🙁 I am saving all my pictures and memories for doing it someday, though. Right now I am more worried about getting all my photos PRINTED and OFF OF MY PC. That is going to cost a small fortune. I’m from Arkansas: Fort Smith. What an awesome day you had. Can’t get that in a classroom!